Cleaning and disinfecting are two different processes. 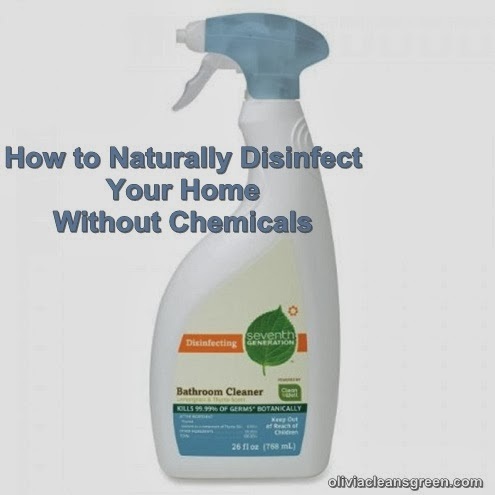 Some products both clean and disinfect, but they must be done separately. Not everything needs to be disinfected, but good spots to pay attention to are toilet seats and flushes, the floor near the toilet, handles to anything, door knobs, cabinet and drawer pulls, light switches, and other things that are touched often. Also disinfect counter tops and cutting boards after preparing meat and seafood. Do not disinfect marble or stone surfaces. Germs can’t grow on those surfaces and the disinfectant is likely to damage the natural stone. Always clean before disinfecting. Remove debris and scrub/wipe surface with a cleaner. Rinse if necessary. Spray surface with a disinfectant. DIY options include the “It’s tea time sucka” cleaner (the recipe is in my book), undiluted vinegar, or hydrogen peroxide. If you prefer store bought cleaners, Seventh Generation makes a wonderful line of botanically-powered disinfecting cleaners, including Disinfecting Bathroom Cleaner in Lemongrass Citrus. Leave on the surface for 10 minutes. Wipe clean and dry with a different cloth. What's one area of your home you always make sure to disinfect?